As a concerned parent you will want your child to perform well at school, Flint and Partners warns that school vision screenings may not accurately measure your child’s overall eye health. Fewer schools offered children eye screening last year, despite the government advising schools to provide this service. 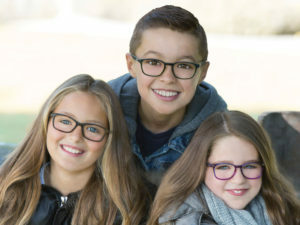 By the time they have reached their 6th birthday, all children should have had a proper eye test with a qualified optometrist. Even though a good part of learning is visual the only eye test many children receive is the entry vision screening at school. Most schools try to do a good job of evaluating students’ vision but a screening is not intended to replace a thorough, professional eye examination, like we conduct at Flint and Partners. A professional eye examination is performed by an optometrist and can reveal serious eye conditions and diseases. Performing well at school can be very difficult if a child has visual problems since they may not be aware that they could see any better. School vision screenings are designed to check a child’s eyesight, or sharpness of vision. Your child’s distance vision is usually measured, which may reveal short sight, but a screening usually fails to check a child’s close-up skills needed for reading, focusing and binocular vision. Considering that most schoolwork is performed at arm’s length, children who have trouble seeing close-up will not be able to reach their full learning potential. We recommend having your child’s eyes examined by Keren Garcha, our accredited School Vision Practitioner. Comfortable and accurate vision is necessary for your child to achieve their very best potential. Slow readers or poor spellers could simply be this way because they cannot see well, or they have poor eye co-ordination. There is no charge to you for NHS sight tests, since the NHS pay us a contribution towards the cost for every child aged 16 and under, or under 19 and still in full-time education.